It's National Short Story Month (Beta Version)! Ah, May, flowers blooming, sun shining, short stories gaining wide recognition. Okay, the last one may be a stretch, but some of us are rolling out something we like to call National Short Story Month (or Short Story Month or International Short Story Month (you get the idea)) to help make that happen. Dan Wickett at Emerging Writers Network is a real force behind these efforts, and he has even managed to get a nifty logo (to the left) designed by Steven Seighman of Dzanc Books and online magazine Monkeybicycle. Dan will be posting often this month on Emerging Writers. I'll try to chime in every now and then. In the meantime, those interested can join the discussion at Readerville (and suggest a story collection for Barack Obama to read). For now, before we get a full-fledged National Short Story Month off the ground with nationwide events and community-wide involvement (schools, bookstores, libraries, etc. ), the best way to celebrate is, of course, to read some short fiction. If you want recommendations for collections published in the past five years (2004-08), you can visit The Story Prize site, where you can find the titles of our 15 past finalists and 61 other notable short story volumes (a feature we didn't add until 2005). The buying links may not work for all of the books, but you can easily find them on IndieBound.org and other online booksellers, if not your local bookstore or library. And don't forget to read literary magazines that publish short stories (in print and online). There are hundreds to choose from, and you might discover a great new short story writer in any one of them, including The New Yorker. Can Jay McInerny Shine a Bright Light on Short Stories? He possesses the literary naturalist's full tool kit: empathy and curiosity, a peeled eye and a well-tuned ear, a talent for building narratives at once intimate and expansive, plausible and inventive. I agree. I immediately connected with Bright Lights. It was a great read, funny and edgy, but it also had deeper levels, which is to say it was more than just a slick surface. Speaking of slick surfaces, I confess that what drew me to Bright Lights in the first place was its striking cover. (How sad to look at it now and see the extinguished bright lights of the World Trade Center.) The Vintage Contemporaries series of paperback originals that Gary Fisketjohn launched in the 1980s featured a common bold design that immediately caught my eye when I walked into a bookstore. Bright Lights was the first of the Vintage Contemporaries I bought, and it led me to Raymond Carver's Cathedral, Mona Simpson's Anywhere But Here, and Richard Ford's A Piece of My Heart, among others. Unfortunately, I wasn't as fond of McInerny's next book, Ransom, and press coverage of his personal life soured my enthusiasm for him as a writer--unfairly. His association, which I doubt he sought, with other "Brat Pack" writers, such as Brett Easton Ellis and Tama Janowitz, seemed to tether him to an era that became almost quaint and campy as time went on. Now, I'm looking forward to reconnecting to that time and those feelings, through How It Ended, and to finding connections in the stories between then and now, a period that pretty much constitutes my entire adult life. 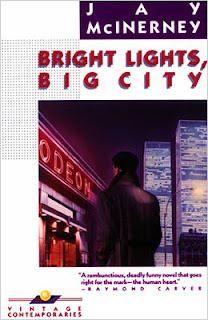 Bright Lights, Big City was a big success and sold a ton of copies. I hope How It Ended will, too. Short fiction needs a blockbuster now and then to open up the form to a wider audience. Jhumpa Lahiri's Unaccustomed Earth and Steven King's Just After Sunset were best-sellers last year, and I like to think that people who have read those short story collections may be willing to try more. Let's hope Jay McInerny's story-telling gifts will also bring more readers to short fiction. 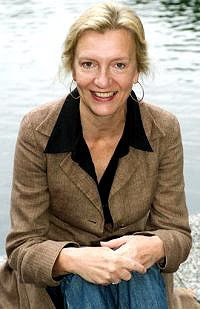 Good news: Elizabeth Strout has won the Pulitzer prize for fiction for her short story collection Olive Kitteridge. It's the first collection to win the Pulitzer since 2000, when Jhumpa Lahiri won for Interpreter of Maladies. Olive Kitteridge, was a close contender for The Story Prize and one of our notable books of 2008. I hope this award puts it into a lot more people's hands. I don't keep up with the chatter, but I doubt many people expected Olive Kitteridge to win the Pulitzer, even though it made a lot of year-end best books lists and was a finalist for the National Book Critics Circle awards. Book awards are highly subjective, and the choices largely depend on who's doing the choosing. This year's jurors were writer R.H.W. Dillard, journalist Susan Larson, and librarian Nancy Pearl (who was a judge for The Story Prize a few years ago). The other two finalists were Plague of Doves by Louise Erdrich and All Souls by Christine Schutt. In any event, 2008 had several exceptional story collections, and I'm glad one of them has won a major book award (besides The Story Prize). Congratulations, Elizabeth--keep those stories coming. National Short Story Month: What Next? The people have spoken (some of them, at least), and the result of our poll so far is that a whopping 90% of respondents agree that yes, we do need a National Short Story month. When I posted about this a couple of weeks ago, I didn't realize that some had already declared May National Short Story Month, including Dan Wickett of the Emerging Writers Network and Dzanc Books, who put forward this idea two years ago. When we rolled out The Story Prize in 2004, I was making some noise about the idea myself (if you follow the link, please ignore the awful caricature), and it wasn't the first time. But it's going to take more than a little noise to make it happen. For NSSM to come about and have any impact, it will need to have a strong organization behind it, a real concerted and nationally coordinated effort, and buy-in from bookstores, schools, and libraries, not to mention authors and publishers. Readerville has been kind enough to host a thread to discuss National Short Story Month, so please weigh in if you have ideas about how to make this happen. The New York Times recently ran an Arts Briefly item about Anchor Books partnering with the writers' group PEN and renaming its annual anthology of twenty short stories culled from literary magazines The PEN/O. Henry Prize Stories. * The item didn't provide many details, so I decided to contact Series Editor Laura Furman to find out more, and though she's at the American Academy in Rome for the month (lucky her), Laura was kind enough to quickly get me some answers from Anchor. What does each side hope to gain from the partnership? The mission of the O. Henry Awards has always been to encourage the art of the short story and, by extension, writers of short stories. Therefore, whatever we can do to lengthen our reach to readers is all-important. PEN is an international organization devoted to the stimulation, support, and sustenance of writers and literature. To this general aim, PEN administers prominent literary prizes each year (including PEN/Malamud for short fiction), and, through the PEN Readers & Writers Program, sends prominent authors to underserved inner-city schools to encourage reading and writing. PEN will use The PEN/O. Henry Prize Stories in its Readers & Writers Program, exposing the short story to a young audience while educating new readers. Does this change anything else about the series? Editorially, the annual collection remains the same and is independent of PEN. The stories will still be selected by the series editor, Laura Furman. Will PEN be involved in any way beyond lending its name? Yes. In addition to using the book in its outreach programs, each year the twenty prize-winning authors in the PEN/O. 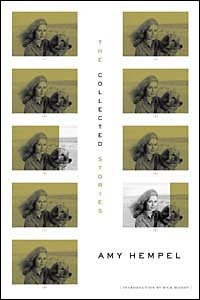 Henry collection will be recognized at the PEN Awards ceremony (which last year was on May 19 at the Walter Reade Theater in New York), giving wider acclaim to the individual achievement of excellence in the short-story form. It sounds like it's primarily about branding, but I think the additional recognition from PEN will be good for the contributors to The PEN/O. 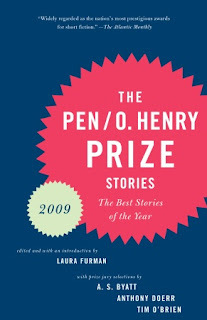 Henry Prize Stories, especially those just starting out. On the other hand, the title of the collection has always been a problem. The competition, Houghton Mifflin's Best American Short Stories, has an unbeatable brand with the perfect name, while readers sometimes find the O. Henry Awards title cumbersome and confusing. The new partnership could exacerbate that problem slightly by lengthening the title (only by three letters and a slash) and adding another element to parse. But, overall, the association with PEN can only be a plus for the series and help to raise its profile. And it should be a nice addition for PEN, as well, connecting it further to short fiction. *In the spirit of full disclosure, I was series editor from 1997 to 2002 of what was then called Prize Stories: The O. Henry Awards. The series dates back to 1919. The winners of this year's PEN/Malamud Award are Amy Hempel and Canadian author Alistair MacLeod, whose work I confess I've never read (and whose name is misspelled on the PEN/Faulkner Web site). PEN/Malamud is an annual award "to honor excellence in the art of the short story" and not for a particular book. The Web site is not very specific about how winners are chosen or the rationale behind the pairing, nor does it specify what the prize amount is. All it says is: "A panel of PEN/Faulkner directors, together with representatives of Mr. Malamud’s literary executors, form the selection committee for the awards." I think literary awards should be as transparent as possible, and I wish PEN/Faulkner were more forthcoming about these details. In October, Hempel also won the $30,000 Rea Award for The Short Story, which has a similar scope. A jury of three writers selects the Rea winner. By my reckoning, Hempel is only the fourth author to win both awards within the space of a year. The other three are Lorrie Moore (2004-05), Grace Paley (1993-94), and Eudora Welty (1992), which puts Hempel in good company. Nine other writers (for a total of 13) have won both the Rea and PEN/Malamud. They are: Ann Beattie, Andre Dubus, Stuart Dybeck, Richard Ford, Alice Munro, Joyce Carol Oates, Cynthia Ozick, John Updike, and Tobias Wolff. So far, the only writer to win these two awards and The Story Prize is Tobias Wolff, who scored the hat trick a month ago.